Sheila modeled her Gradient Shrug at the Holiday Luncheon Fashion show and lots of people wanted the pattern. 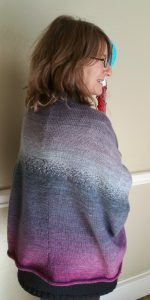 If you would like to learn how to make a shrug of your own or how to create your own gradient, this class is designed for you. 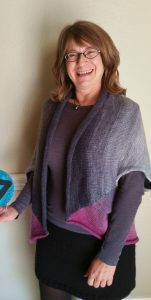 1) How Sheila modified the pattern to make a more fitted shrug. She’ll share her calculations, so you don’t have to do the math. 2) How to create chromatic and tonal gradients using two, three, or twelve colorways, including techniques to fade one color into another. Click here for further details, including time, location, and contact information.